Nietzsche said the last Christian died on the cross. That is such a bold, yet powerful and piercing statement. Is it true? In some ways I feel that it is. And that’s painful! It’s not just how one man saw it, either. I think a lot of people see it that way. In her comments on my last post, Lisa wrote, “So many people laugh at the ‘Bible thumpers’ and think they are complete lunatics. They lump all Christians together and view us with such a negative light. How can we change that? I think we change that by changing how we do things. It’s so simple. We have to love, not judge. It’s a joke how much we judge in the church. We judge other people. We think we’re better than other people. We think we’re better human beings because we found Jesus. And love is just so good, man. I’ve seen the good that comes when you don’t judge other people. I’ve been around when someone does something that I know is wrong. They look at me as if to say, “Oh, you’re a Christian guy, you think you’re better than me.” They look at me to see if I’m going to look at them wrong. They expect me to shake my head and judge them right there. That heals the soul immediately! When you do that, people are blown away. They’re like, “Whoa, wait! That’s not how it’s done!” Well, they’re right! That’s not how it’s done, because we haven’t been doing it right. Jesus is the one that showed us the right way to do things. The church’s calling is to love. 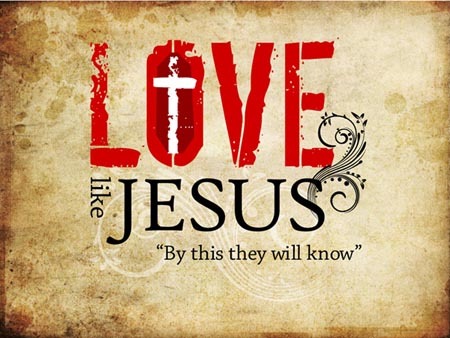 We are called to love like Jesus. This entry was posted in Church, Judgment, Love and tagged judgmental churches, last Christian died on cross, loving like Jesus, Nietzsche and Christians. Bookmark the permalink. First of all, thanks for reading my comment in your last post. It’s hard. I feel like it’s sort of a Catch-22 situation. If you aim to be a good Christian by not judging others, and instead love everyone regardless of their faults, people (Christians or non-Christians, it doesn’t matter) will still think, “Oh, he/she is a Christian…therefore, he/she is a judgmental person and I do not like them.” I see it all the time. People automatically associate all Christians as being judgmental people no matter what. Christians have judged them, so they judge Christians right back. I agree that we have been doing it wrong, and the only way things will change is if we lead by example and try to shift the public’s perception. Something as simple as loving instead of judging has the power to change SO much. We have to go back to the basics! Thank you for being such a great leader.